Happy Birthday, Franks Hamburger House! 2017 marks their 5th birthday as Northamptonshire’s finest hamburger house which has been serving North-ampton, Cogenhoe, Towcester, Welling-borough and Long Buckby with freshly prepared food from Hamburgers, Hot Dogs and Chicken Wings to Vegetarian and Gluten Free options. Franks is a family-friendly environment, so everyone and anyone can enjoy a Franks restaurant experience within the county. Franks Hamburger House is a Northamptonshire based chain of restaurants. If you don’t believe us, their innovative menu will certainly make you feel at home. Enjoy the Express Lift Tower burger which will taste far better than abseiling down it! Or if you’re dining at the Towcester restaurant, you can enjoy a Watling Street Burger on the exact road location of the restaurant! Rugby fan? Dig into a Saints Chicken Burger, or if you’re in the mood for a wrap; The Abington Pork Wrap will satisfy your taste buds. 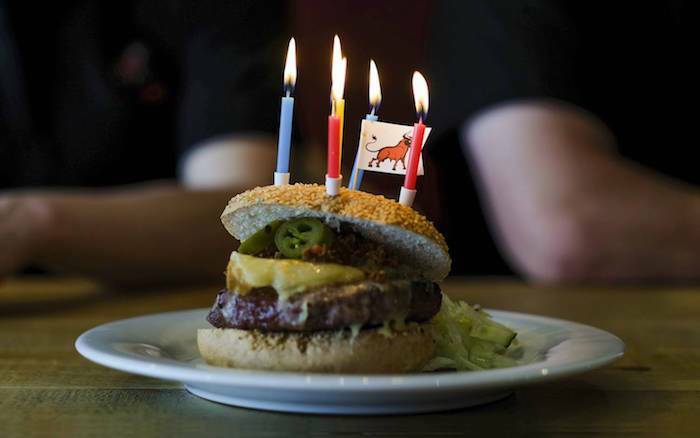 Let’s rewind to 2012 where it all began… 5 years ago, Tom Hewer, a highly dedicated and talented Chef decided Northamptonshire needed it’s own chain of burger restaurants that would source local ingredients, so Franks Hamburger House (a name inspired by his son, Frank) was created with its first restaurant opening on Wellingborough Road, Northampton. To this day, the restaurant is still running and open for business and Tom Hewer is known as the leading man on the Northamptonshire food scene. Over the last 5 years, several other restaurants have opened following on from the success and has over 120 employees working for them. This is when Tom decided to start a new challenge by forming Tom Hewer Catering, who cater and look after a division of pubs and restaurant groups, including Franks Hamburger House. For our readers that are regular visitors to Franklin’s Gardens, Wembley Stadium, Sixfields or Northamptonshire County Cricket Club, there is every chance you’ve seen the Franks brand as they are delivered by Tom Hewer Catering Ltd, a stadia catering specialist, that has representation at a number of sporting venues and festivals which include Glastonbury and BST Hyde Park. Tom won Entrepreneur of the Year Award in 2015 at the Northamptonshire Food and Drink Awards, this followed Franks being a Finalist in the Restaurant of the Year category in 2014. To celebrate their 5th anniversary, Franks hosted a series of Man vs Franks challenges at their Wellingborough Road rest-aurant, where they challenged the people of Northamptonshire to take part in a food challenge to eat as many hamburgers as possible within half an hour. Four competitors beat the rest and were put to the ultimate challenge of becoming Franks Finale Winner, which took place on Monday 29th May. To find out more about Franks Hamburger House or visit www.frankshamburger.co.uk.